Forget the free plane ticket to Toronto — cheer up your mum with a nice tin of soup! Forget paying for that flight to Toronto for your mum — send her a tin of soup instead! As you can see in our tagline at the top of the page, Brits in Toronto was Voted “Best New Website 2013” by my mum. We’re all very proud of that honour, and even though our mums — and other loved ones that we left behind to move to Toronto — may still be living on the other side of the pond, you can now treat them to what they’ve always wanted: a nice tin of Heinz Soup. Now in its 5th year, the campaign designed by We Are Social lets you order soup for a loved one who may need a little pick-me-up. Here’s the Facebook page. You can even personalize the cans, and as a bonus, £1 from each sale will also be donated to children’s charity Starlight, to bring magical storytellers to seriously ill children across the U.K. 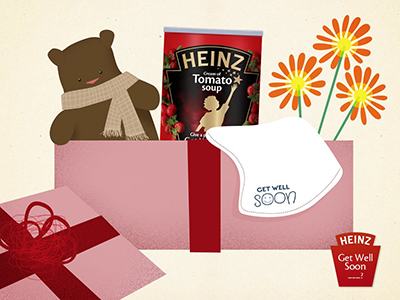 This entry was posted in Uncategorized and tagged brits in toronto, get well soup, heinz, we are social on February 5, 2015 by britsintoronto.